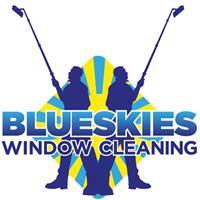 Blue Skies Window Cleaning Limited - Cleaning Services based in Brighton, East Sussex. Blue Skies Window Cleaning Ltd provide a reliable and highly professional service to both commercial and domestic clients in the Brighton, Hove and Sussex area in general. We clean windows, frames and window sills as standard up to around 50ft high (4-5 floors approx.) using water-fed poles, on a weekly, 2 weekly, 4 weekly, 8 weekly or as a one-off clean. Higher windows can be accessed with the use of a cherry picker, upon request. Conservatories cleaned inside and out to a very high standard. Gutter clearing services are available up to 40ft using wide poles with an industrial powered vacuum cleaner and a wireless camera to monitor the progress and check for any blockages or any pre-existing damage caused by the ingress of water. We also provide jet washing services for cleaning driveways and patios etc. Safety is taken very seriously and therefore risk assessments can be provided when required. Payments can be by cash, cheque, Gocardless or a direct bank transfer.